Are you frustrated, stuck, or giving up on trying to communicate? Are you stressed by the unresolved arguments or the growing distance? Do you yearn for more connection, to feel accepted and more at peace? Trying something new with your partner takes courage. Your marriage, relationship, and family are important and you deserve the best chance at success. I can help you not only reduce conflict and improve communication, but feel safe, connected, and relaxed with your partner. My approach is collaborative, engaged, and draws from the best science on love relationships. My primary therapy methods are Emotionally Focused Couples Therapy (EFT) and Gottman Method Couples Therapy. What happens when we meet with you? First, we explore whether Intensive Couples Therapy is right for your relationship by scheduling a free phone consultation. In the beginning of therapy I spend time gathering information to help me understand each of your realities, perspectives, and unmet needs in the relationship. I have an individual interview with each of you and learn about the history of your relationship. Then we get to work understanding and dismantling what is standing in the way of having the kind of safety and connection that you want. I will help you create or rebuild the safety that has been missing. This sets the stage for new, more positive interactions and having meaningful conversations and connections with each other. I will give you tools to use at home to keep your relationship on a positive track. We will also decide on a plan for maintaining the progress that is made with follow up sessions. Many people are concerned about this and are afraid of being labeled “the bad guy or gal.” I don’t view couple interactions as “right” or “wrong”; each partner has a part in the relationship dance. I will support both of you in owning and sharing your experience with your partner in a way that is genuine and constructive AND help both of you to listen and understand your partner’s reality and experience in the relationship. Together, you will discover where you may want to change. We’ve had a bad experience with therapy in the past. How will this be different? Almost everyone feels nervous about beginning couples therapy. It can be hard to try again and risk putting faith in a new therapist when you’ve previously had a negative experience in individual or couples therapy. I take great care to create a therapeutic environment where all three of us are respected and understood. I believe that awareness, healing, and connection happen when you feel safe to explore and communicate your genuine experiences. I also take my work as a couples therapist very seriously. I see couples therapy as a specialized form of therapy that requires a high level of skill and training. Sometimes, partners who have had a negative experience in couples therapy either didn’t have the right fit with their previous therapist, or the therapist had an individual approach without specialized, scientifically-based training in couples therapy. 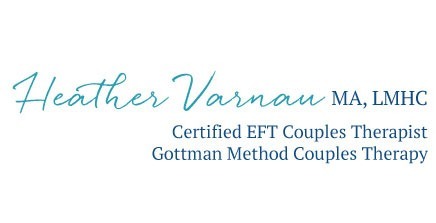 I practice the two most researched and effective forms of couples therapy available: Emotionally Focused Couples Therapy (EFT) and Gottman Method Couples Therapy. EFT is a short term structured approach to couples therapy formulated by Dr. Sue Johnson. EFT has been validated by 20 years of empirical research and is approved by the American Psychological Association. Several meta-analyses have shown that EFT is the most successful approach to couples therapy. These research studies find that 75% of couples move from distress to secure emotional connection and approximately 90% show significant improvement by the end of treatment. The results are stable 2 years later. These are excellent statistics! Combining the knowledge and wisdom of nearly forty years of studies and clinical practice, Gottman Method Couples Therapy helps couples break through barriers to achieve greater understanding, connection, and intimacy in their relationships. Through research-based interventions and exercises, it is a structured, goal-oriented, scientifically-based therapy. Intervention strategies are based upon empirical data from Dr. Gottman’s study of more than 3,000 couples. This research shows what actually works to help couples achieve a long-term healthy relationship. Every couple has different circumstances and scheduling needs to consider when starting couples therapy. After many years of offering traditional, weekly couples and marriage counseling sessions, I have come to realize that many couples need a more powerful injection of hope and change in their relationship than weekly therapy can offer. That’s why I developed a highly effective, focused way for couples to get a shot of momentum toward healing and change right away by working in an intensive format. To learn more about whether an Intensive session is right for your relationship, schedule a free phone consultation. Intensive Couples Therapy is a cutting-edge, retreat-style approach to working on your relationship. You will receive my full attention for three days so that we can put your relationship on a new, positive track. Held on Lopez Island in the world-class beauty of Washington State’s San Juan Islands, an Intensive can help you move through three months of weekly couples therapy in just three days. Read more about the Intensive Couples Therapy format, logistics, and rates.